VR-Zone got hold of AMD’s Internal documents which detail the companies upcoming APU launches including Kaveri and its successors – Carrizo APU. While Kaveri has been delayed and pushed to a new launch date in mid-February 2014, Carrizo APU would arrive in 1H of 2015 bringing some new HSA and architecture enhancements. AMD’s Carrizo APU is Kaveri successor and has been confirmed by VR-Zone to feature the latest Excavator core architecture from AMD. 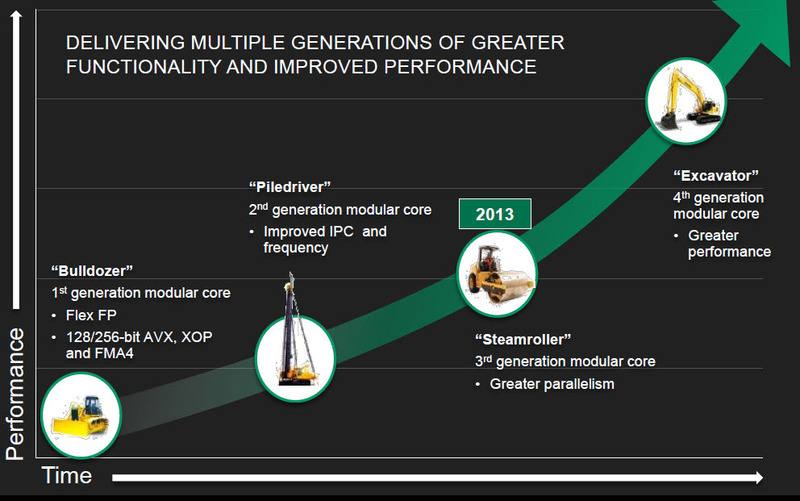 Excavator would push x86 performance to new heights and is itself going to replace the 28nm Steamroller architecture that would be fused on the Kaveri, Berlin, FX Processors (Not confirmed) and next iteration of Opteron Enterprise processors. On the GPU side, its not know what kind of architecture would be implemented as part of the Radeon core. By 2015, AMD will have released their Volcanic and Pirate Island (20nm) chips so they have the option to choose from either of those but if i was to take a wild guess at it, i would see the Volcanic Islands to be fused along side the Excavator core. It should be noted that Volcanic Islands discrete GPUs are also arriving for desktop PCs in Q4 2013, possibly October codenamed “Hawaii” delivering the next generation of visual and compute performance for gamers and enthusiasts. Kaveri APU on the other hand would be equipped with the current Southern Islands GCN cores with upto 512 stream processors pitting its performance close to current entry level discrete graphic cards. Although not confirmed but VR-Zone also mentions that DDR4 memory could be brought to Carrizo APU. The Carrizo APU will be compatible with the Bolton-D4 A88X chipset which currently offers support for Richland/ Trinity and Kaveri APUs. This could mean that the Carrizo APU may be compatible with the FM2+ socket boards which just started appearing from different manufacturers. On the other hand, Carrizo APU is said to be available in 65W TDP parts and also possibly 45W TDP parts. Kaveri APU which launches next year will have 100W and 65W parts, this goes off to show the power efficiency that would be delivering with the next generation Excavator core.